Following an injury as a collegiate tennis player, Dr. Vela developed an interest in overhead injuries and a passion for helping athletes get back to peak performance. He specializes in treating overhead and throwing athletes and provides comprehensive shoulder-to-hand treatment. Dr. Vela cares for athletes of all ages, from high school to semi-pro, throughout the greater Oregon area. 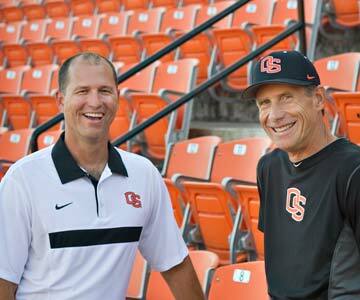 He also serves as a team physician for Beaver Athletics at Oregon State University. Dr. Vela has been helping athletes of all sports, dating back to his first season in 2006 with the NCAA College World Series winning baseball team. As an athlete, Dr. Vela understands the importance of getting you back in the game as quickly as possible. Dr. Vela prides himself in staying at the forefront of orthopedic surgery. In addition to being an active surgeon and team physician, Dr. Vela also serves as the director of medical education and orthopedic surgery residency program director for Samaritan Health Services. Dr. Vela has served as the program director of the orthopedic residency program since its inception in 2010. This role enables Dr. Vela to stay on top of the ever-evolving field of orthopedic surgery. He is excited to be working to define new techniques and better outcomes for the future of orthopedics. Dr. Vela completed a fellowship in hand and microvascular surgery with additional specialty training in shoulder and elbow. In his free time, Dr. Vela enjoys spending time with his family. He enjoys whitewater kayaking, hiking and alpine skiing in the Oregon outdoors.